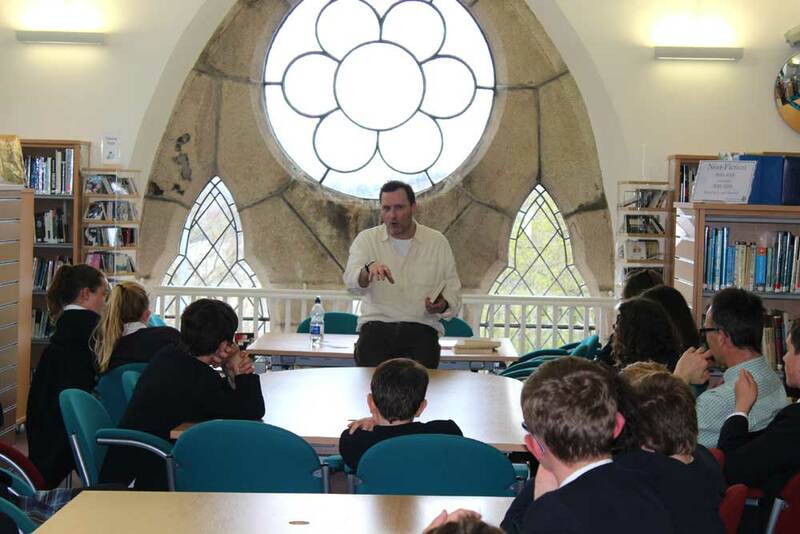 On Tuesday 28 April, 1st and 2nd Year students at Truro School were treated to an English workshop led by famous British author Anthony McGowan. Anthony, whose first book was published in 2004, has built a strong reputation over the last decade writing a number of critically acclaimed novels aimed at teenage and adult audiences. The students heard about Anthony’s life experiences and writing techniques throughout the workshop, reflecting on when he attended school in Leeds and how he twists his own happy, sometimes painful memories, into storylines. Having attended school in the era of the cane, Anthony’s writing is often dark and serious, unusual for a writer of teenage novels. 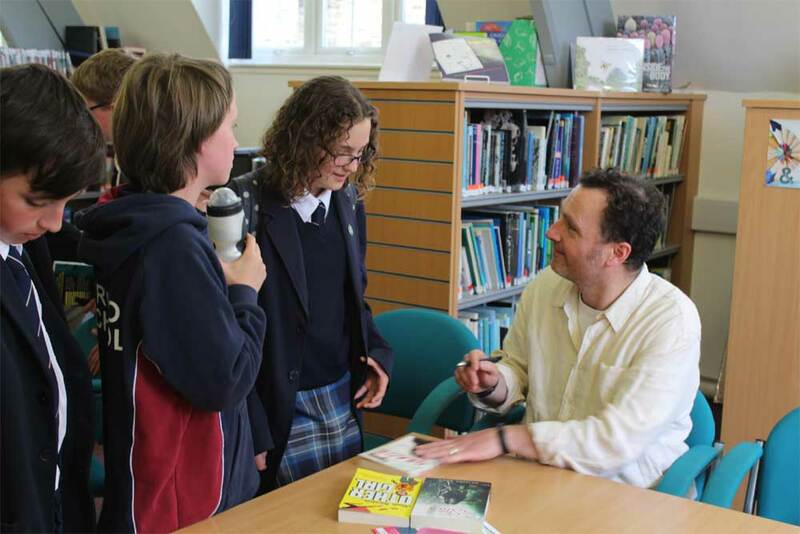 Following a captivating workshop, Anthony devoted some time towards a Q & A session, an opportunity which was grabbed with huge enthusiasm, the author thanking the students for some of the best questions he’d ever had. Anthony admitted that he would have chosen to be the person who intercepted the bullies, rather than be the bystander. This regret, he explained, was one of the reasons that he wrote The Knife that Killed Me, a novel exploring how young people become involved in crime, for reasons of self-defence as much as peer pressure. The author divulged to the students how he drew upon his own school experiences when writing such novels, recalling the times that he had witnessed bullies and bullying to shape the story. The Knife that Killed Me was made into a film last year, and students attending the talk were able to watch the trailer and get a feel for the adaptation. Mr McGowan’s visit to the county tied in with being shortlisted in the Kernow Youth Book Award (KYBA), an annual awards ceremony where all of the candidates are selected by young people throughout Cornwall. 13 enthusiastic young readers at Truro School had contributed towards the voting with many other Cornish schools taking part. The author was up against some big names at this year’s KYBA including Gillian Cross, Eoin Colfer, Alex Gutteridge, Sophie McKenzie and Holly Smale. It was Sophie McKenzie who picked up this year’s prize, pipping Anthony to the post with her novel Spilt Second at the Keay Theatre in St Austell on Wednesday 29 May. ‘As well coming down with the hope of winning an award, I’m also on a reconnaissance mission to get a taste of the county. My family and I are considering it for our next holiday’. Mr McGowan is not the first famous author to visit Truro School. American writer, and friend of Anthony’s, Meg Rosoff visited Truro School back in February leading a workshop with students in the older year groups. Anthony’s next book, Pike, comes out in May 2015 with the plot kept firmly under wraps until publication. Pike is set to be a sequel to his 2013 book ‘Brock’, a story about one boy’s determination to save a badger cub from the destructive hands of a local gang.